The picture above is of one of our Pro Series Combination Mash Tun Stripping Stills. 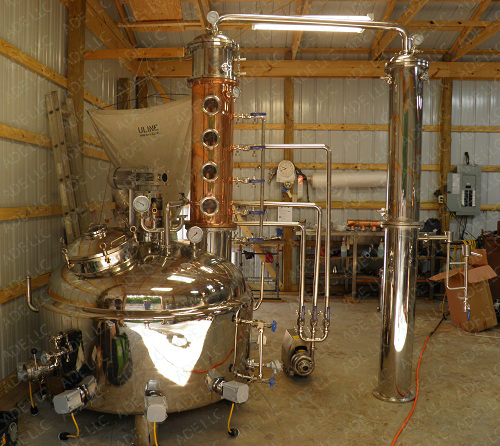 If you would like to visit the Distillery to see this still in operation and hear what the owner has to say about this still just email us paul@distillery-equipment.com and we will send you the contact information. The Picture above is one of our Jacketed, Steam Heated, Pro Series Combination Mash Tun Stripping Still. Our 600 gallon Mash Tun Stripping Stills work best when heated by a Low Pressure Steam Boiler. Click on the Low Pressure Steam Boiler link to the left to see our Low Pressure Steam Boilers. Our 600 gallon Combination Mash Tun Stripping Still is 10'6" tall but it can be scaled down to 8' 10" tall. The width of this Mash Tun Stripping Still, including the condenser is 13'6". 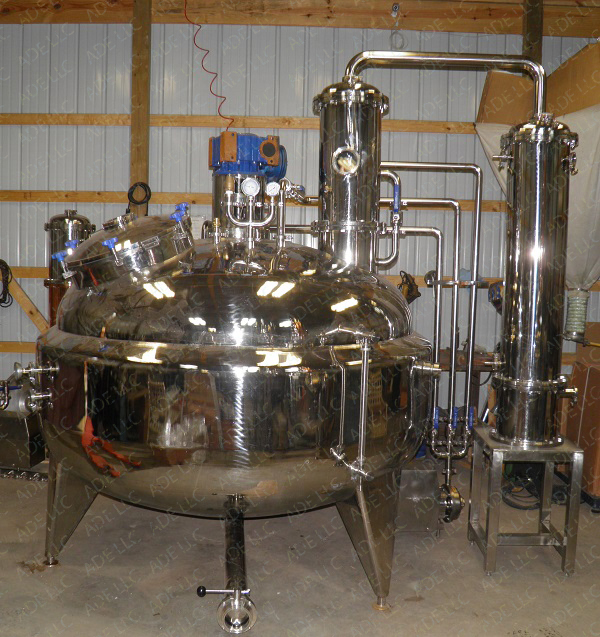 This 600 gallon Combination Mash Tun Stripping Still is great for cooking mash and stripping runs and with the optional bubble plate, it can be used for Brandy, Moonshine and Whiskey. The drawing below shows our newest design. This new design improves efficiency and decreases mash cooking time. Prices are the same for the new off center column design and the old centered column design. 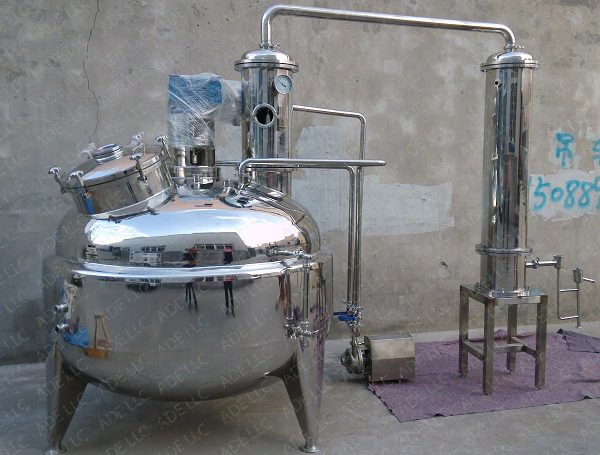 The new design has better agitation while maintaining the same characteristics as the old design for the stripping run. 1/3 Payment due when ordering equipment. To order additional options, please call 417-778-6100. 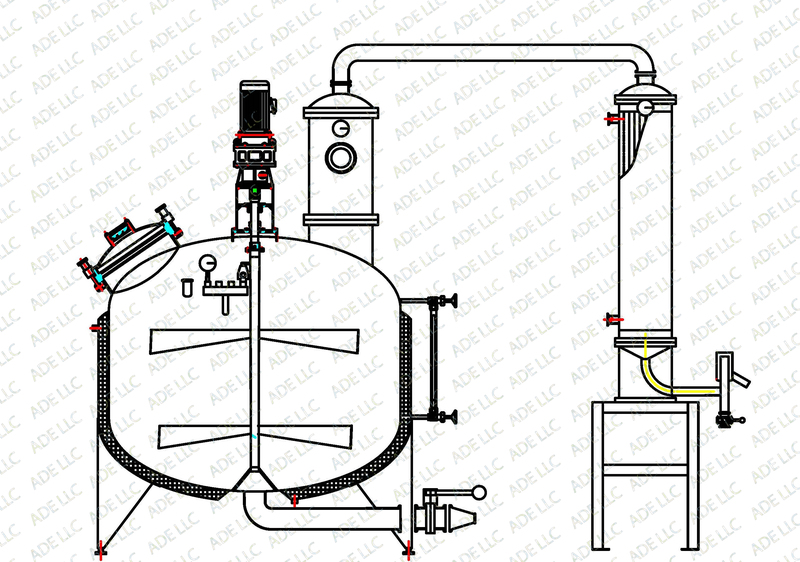 The picture below is of our Electric Bain Marie Pro Series Combination Mash Tun Whiskey Stills. Please call or email for info and pricing.